Also, this event is put on in collaboration with Mussels in the Kettles. If you want to ride the trails the day before our event, register at Mussels in the Kettles. Thanks to Matt Plush who coordinates his group to set up the trails, you are a blessing!! If you are interested in camping at Fort Ebey, you can register for a site on March 1st. Make sure you have a DISCOVER PASS and car pool if possible, the ranger wants no parking issues. There will be a volunteers, who are assisting with parking. Whidbey Bicycle Club, who sets up the course for Cookin, will have a couple people at the entrance of the park checking for discover passes. If you have one, you can go straight to the registration area, if you do not you can take a right and go to the ranger shack and get a pass and come back only a 1/2 mile detour. Once on the access road to the registration area there will be a parking attendant to get you parked in the correct areas and pointing in the right direction (ranger will ticket illegal parkers). Ideally, participants should drop their gear at the turn around area and one person would drive out park the vehicle and ride back to the registration area. Participants in the campground area will be able to ride a 1/2 mile of trail to registration area. MusselFest Weekend, riders of 'Mussels in the Kettles' or 'Cookin in the Kettles'? Candlewood Suites (33221 State Route 20, Oak Harbor, WA 98277 - 360-279-2222) is happy happy to offer a 15% discount for all attendees. 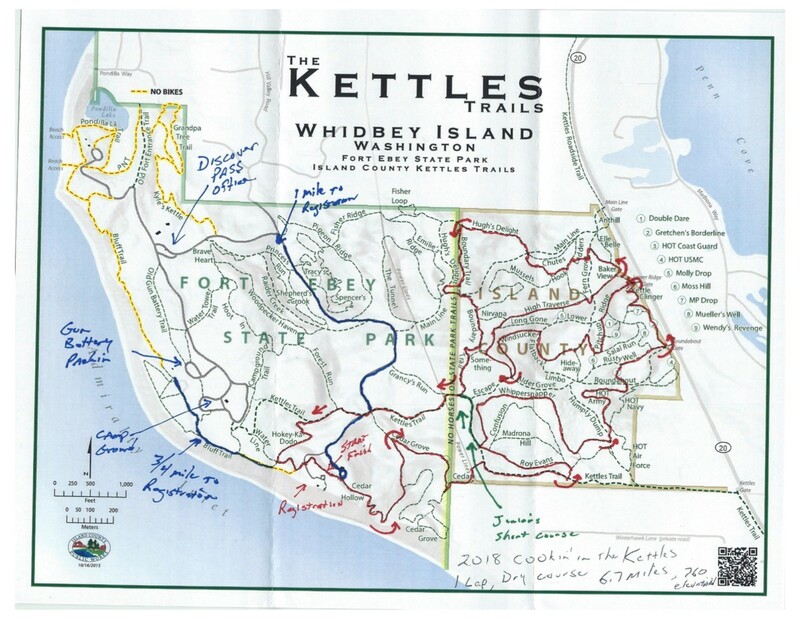 Guest can call and mention Whidbey Island Bicycle Club when making reservations. Fort Casey Inn is offering all our riders 20% lodging for the weekend. Mention Whidbey Island Bicycle Club or the ride you are doing (Mussels in the Kettles or Cookin in the Kettles) for the discount. Also Best Western in Oak Harbor is offering discounts. Same as above mention which race or WIBC at registration. Try to follow Mussels in the Kettles (FB) on Facebook for all the deals. Registraiton will open at 8:30am the morning of the event. You must register by 15 minutes before your Category begins (see Course Information and Maps for Category Start Times). EVERYONE must check in, whether you registered online or have a pass.